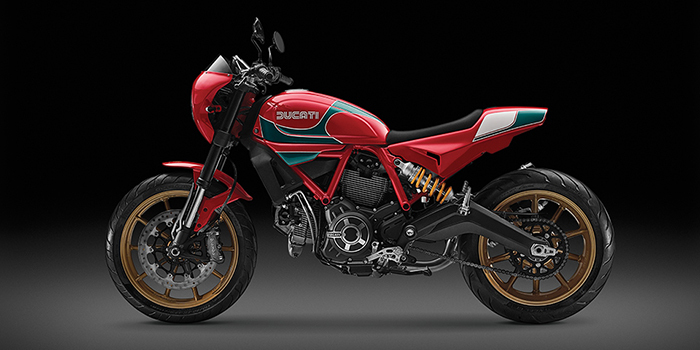 Ducati Thailand has put our a number of handsome customs to date and they’re at it again, this time with a pretty cool, and very limited-edition Mike Hailwood-inspired Ducati Scrambler. This exclusive Ducati Scrambler Special Edition Mike Hailwood is inspired by the Ducati 900SS that Mike Hailwood rode to victory during his legendary Isle of Man comeback in 1978, eleven years after his retirement from motorcycle racing. 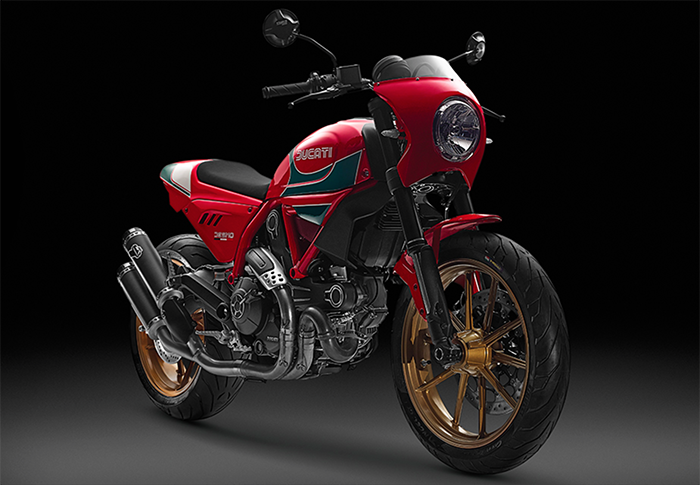 The bike is based on the Ducati Scrambler 800 and while the majority of the updates are in graphics and unique bodywork, the bike does get an Öhlins rear shock and Termignoni pipes, which is nice. Nose fairing – The nose fairing and tinted screen were specially customized with the 70’s look to emphasize even more the unique style of this limited edition Scrambler Hailwood. Fuel Tank and Frame – The Scrambler Hailwood finds a new form in its 14-liter steel tank and frame with the special paint in dynamic red livery that mimics Mike Hailwood® 900SS that he rode to his legendary comeback in 1978. Custom seat – The custom ‘monoposto’ seat unit of the Scrambler Hailwood® which made by plastic ABS as factory quality was specially articulated to resemble Mike’s race winning bike in 1978, with a custom made underseat panel that enhances the overall aesthetics of the bike. Handlebars – The Scrambler Hailwood combines modern ergonomic with classic sport bike by swapping the conventional Scrambler’s handle bar with the special made handle bar, making it lower and closer to the rider for enhanced maneuverability. Handgrips – The handgrips have been replaced with the grip from Ducati Superbike, to add a sporty touch, giving its rider ample feel and confidence attacking corners. Mirrors – The Scrambler Hailwood features a Ducati Performance mirror in a black anodized finish, crafted from high quality billet aluminum that is fully adjustable. Special aluminum number plate – The Scrambler Hailwood is made in limited number of only 58 units worldwide. Each bike comes with its own individual number inscribed on the top of the seat cover, making it a truly unique collectable motorcycle art piece. Turn indicators – Low-pro LED turn signals front and rear were keep things tidy and minimalistic for the Hailwood edition. Suspension – The Scrambler Hailwood utilizes an Öhlins rear shock exclusively design for Scrambler Hailwood, featuring adjustable rebound damping, with easy pre-load adjustment. The bike also sports an upside down Kayaba 41 mm front fork. Exhaust – What would a Hailwood replica be without a race exhaust? A Termignoni Exhaust system gives the premium touch and increased performance/flow to boot. Wheels – The Scrambler Hailwood mounts ten-spoke light alloy wheels, 18 inches up front and 17 inches in the rear, wrapped in Pirelli Angel GT rubber. The rims are specially painted gold just like the Ducati 900SS that Mike Hailwood®, rode to victory at the Isle of Mann in 1978. The Hailwood Scrambler lists at 699,000 Thai Bhat, which is just north of $19,500. A steep price to pay no doubt, but Hailwood name brings a undeniable cool factor, the limited edition ups said cool factor and hey – a portion of all the proceeds goes to Hailwood estate, which is pretty cool in and of itself. Lots of customs out there, but this one nails it. It's definitely a fun build! There STILL are a few left. You should snag one up!